Ah, here come my friendly visitors with seed baggies ready and pruning shears firmly clenched in hand, ready to get some more material from today's tour in the garden as they know we are going to meet with another set of members of the Acanthaceae family. And they are right! Those shrubs, sub-shrubs, climbers and other plants are usually quite decorative, easy to grow and to propagate so it would be a pity not to give them a try. Ladies and gentlemen here is our first "victim!" This one is a member of a medium-sized genus with some 20 to 30 species, all those guys coming from Tropical America. This means that quite a few of them have already made it to the U.S. market as indoor plants. Being tropical, they will not do well in gardens of Montana or Idaho in winter. 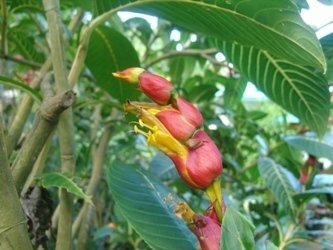 This one has been in the horticulture trade for a longtime and nowadays is a familiar sight in many a tropical to sub-tropical garden throughout the world, yet it does not have a common name, Sanchezia speciosa (or Sanchezia nobilis) has quite distinctive habit and look and can be spotted from far away. Coming from the Andean areas of Peru and Ecuador it has thick four-angled stems, pale green to yellowish and large, showy leaves. Those are up to 40cm long (16 inches) glossy green with conspicuous yellow veins making the plant attractive even without flowers. 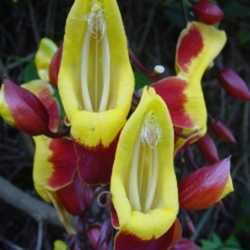 The flowers themselves have the shape of a tube, bright yellow, partly covered by the red rounded bracts and produced all year long. This species is a quite long-lived one (for a shrub) as the one in front of you was one of the very first plants I put in this garden 16 years ago. It will enjoy light sandy soil in partly shaded spots and will not do well in dry places. Please take a few cuttings, this will help keep the plant lower and more compact. Cuttings are how I propagate it as I have never seen it producing seeds. Just a few steps further we now meet a member of a much larger genus. Indeed, with more than 400 species this is a serious one to get acquainted with. This genus is large because it now hosts several genera that used to be separate such as Jacobinia or Beloperone; hence many synonyms are to be found there. 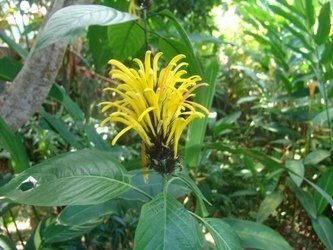 And yes, this funny-looking plant with the funky-looking head like some kind of psychedelic bright yellow wig is nowadays called Justicia aurea while it will often be found in older books under the name of Jacobinia aurea. Coming from Central America, this is a modest plant reaching 1.5m (5 feet high) with an erect habit, in fact it can grow a solitary slim stem with just a few leaves and one terminal inflorescence, nothing exuberant like the previous species. This makes it a good combination with low-growing plants and groundcovers as one can play with the different heights. The only drawback is that flowering does not go for a long time. A semi-shaded exposure will suit it fine. Now for a change, let's meet a small climber. And a rather well-known one, the "black-eyed Susan" known in French-speaking areas as ‘Suzanne aux yeux noirs' is quite common in tropical and subtropical gardens as well as under glass. One reason for its ability to seduce gardeners is that it is a vine but a manageable one, it will not take over your garden or cover the whole green-house as soon as you turn your back like many tropical climbers but yet it still gives the opportunity to ornate fences or decorate vertical strings. It belongs to a genus of circa 100 species of shrubs and climbers, mostly coming from Africa and India. 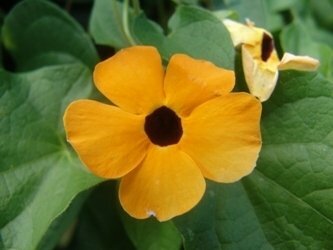 Our delicious little Susan here comes from Tropical Africa, Thunbergia alata is often used as an annual in temperate climates while it will be a perennial under more favorable weather. It produces a twinning wiry stem up to 2.5m (8 feet) high with simple arrow-head shaped leaves. The solitary flowers are usually orange with a dark throat but some cultivars can be white or pink, with a dark or white throat. Two conspicuous shell-like bracts make the Thunbergia genus easily distinguishable. This one will do better in full sun and can become invasive as it tends to seed quite easily. Last but not least, we have a tough species erroneously names ‘Philippine violet' as it comes from India. Here is Barleria cristata. 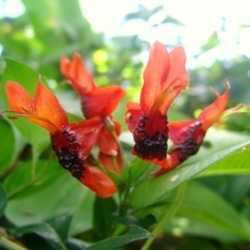 The Barleria genus comprises around 250 species, either from Africa or Asia, just like the above Thunbergia. 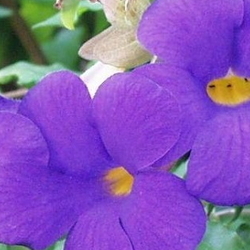 This violet-flowering plant is widely grown in gardens where it may bloom all year long, it will be used as low hedges as it will not go over 1.5m (5 feet) high or for mixed borders where it will be trimmed to be kept compact and low. 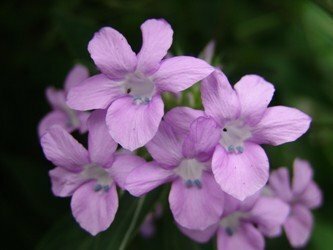 The flowers have a trumpet-shape and are born by two or three, enclosed by spiny bracts (we will meet another very spiny Barleria when we'll go hunting for wild Acanthaceae.) Full sun will be required for optimum flowering and well-drained ground is necessary, this is in no way an understory plant like Strobilanthes dyeranus or Ruellia makoyana! It also tends to seed heavily and during sunny days one can clearly hear the fruits suddenly splitting open and throwing seeds around but it is not (to my knowledge!) registered as invasive. And yes, this is already the end of this visit, I hope you liked it and will manage to have all those cuttings rooted and plant them in your own garden. Cheerio!